Mistress and Captain Brett Alty have received the award for top release Captain Black Marlin Pacific Ocean by the Billfish Foundation. All of the black marlin were caught in the Cairns Great Barrier Reef heavy tackle Black Marlin season by the guests that chartered Mistress in 2012. We still have dates/days available for charter for the Cairns black marlin season this year. With all the pressure being put on the Great Barrier Reef and Cairns fishery by the Green Movements, it is looking quite possible that the marlin fishing fleet will be closed out from fishing for the Giant Black Marlin in this area in the forseable future, so we urge anglers to take the opportunity to book fishing trips now to make the most of the fishing in this area while it is still available. Captain Brett Alty and Mistress were also awarded the top release captain for Blue Marlin in the Pacific Ocean. All of these blue marlin were caught on the Gold Coast (1 hour south of Brisbane). The Gold Coast has always been one of the worlds best blue marlin fisheries, although it is not commonly known. Captain Brett Alty and Mistress’s best blue marlin day saw 11 blues and one striped marlin released between the hours of 8:30 and 4:30. The Billfish Foundation has released it’s winner for 2011. 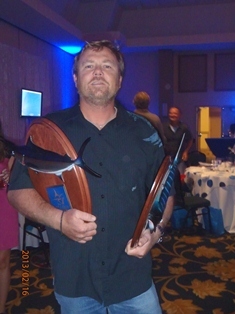 Mistress‘ Barry Alty has won the Top Angler Black Marlin for the Pacific Ocean, once again! Captain Brett Alty has put Barry on to the Giant Black Marlin in Cairns in large numbers. All of the black marlin released by Barry this year were in the Cairns Giant Black Marlin fishery, with two of the Black Marlin estimated to be over 1000lb. Congratulations to Barry and the Team on Mistress: Captain Brett Alty and crew Jonathan Lawrence and Rodney Van Der Heide.